The 1st District, or Innere Stadt (prime area), is also the original old town of Vienna. As a Historic City Centre, it was placed on the UNESCO World Heritage List in 2001. The Innere Stadt is a conspicuously wealthy district, and staying here is decidedly expensive. It thrives heavily on tourism, with a large concentration of historic and cultural attractions such as Stephansplatz, St. Stephen's Cathedral (Stephansdom), the Burgtheater, and the Vienna State Opera. Many parts of the district are lined with Baroque or fin-de-siecle buildings along narrow cobbled lanes. 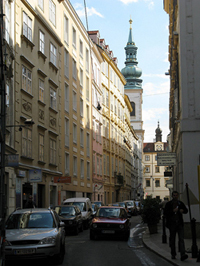 Because of the cramped streets (most of them one-way), it is not advisable to drive a car in the Innere Stadt. The 1st district is also the main administrative and political centre of Austria. Here you will find the city hall of Vienna, the houses of parliament, the Austrian Federal Chancellery (Ballhausplatz), and the Hofburg Imperial Palace, which is the official residence of the President of Austria. The district also houses the headquarters of numerous multinational corporations. The 1st district is where you will find the Stadtpark, the largest park within central Vienna. Another public park and garden called Volksgarten borders Heldeplatz Square, the Burgtheater, and Ballhausplatz. Other parks in the district include the Burggarten and the Rathauspark (City Hall Park). Several major shopping avenues wind their way through the Innere Stadt, including Ka'rntner Strasse and Am Graben. These streets both start at St. Stephan's Cathedral, from which Am Graben leads west, while Ka'rntner Strasse proceeds south. You will find many high-end designer boutiques and luxury stores on these avenues. Another major shopping street is Kohlmarkt, known for its luxury stores and the famous chocolatier Cafe Demel. Other streets around the district feature jewelry shops, antique stores, art/craft stores, bookstores, restaurants, and classic Viennese coffeehouses such as Cafe Hawelka and Cafe Central. The Innere Stadt has a lively nightlife with a range of options to suit any budget, from Irish pubs where you can quaff a cheap pint or more, to ritzy bars where you pay through the nose to party with the city's social elite. Many of the city's best bars are concentrated in this district.